We arrived at Devil' s Lake Trailhead at around 11:00PM on a Friday Night after making the four hour drive from Portland to the Bend area. We'd stopped off at a pub in Bend for some good trail food: Pizza! At 11:00PM, we calculated that we could sleep for three hours and get going at 2:00AM to summit sometime in the late morning. We snoozed in the car and at 2:00, we were up and raring' to go! We were all packed up, with ice axe, crampons, snowboards and snowboard boots strapped onto our little (2800 sq.in.) Redwing packs. We headed up the trail in the dark, finding it quite hard to follow. Immediately we crossed over a stream on a footbridge, and ended up at a culvert and a flooded stream by the foot of the road. We hopped up onto the road and looked around for the trail marker across the street. It was marked by a lone, unmarked wood post up the street a ways. We followed the path into the woods and found the climbers permit station where we signed in for our self-issued permits (required). Almost immediately we found the trail impossible to distinguish. There was no path, and in the intermittent snow patches, there were no footprints. The moon was behind the clouds and we were having much difficulty navigating on the trail. On hindsight, we should just have set a compass bearing and shot through the woods, but we wanted to stay on the trail just in case. Finally we made it out of the woods, and climbed up a steep hill onto a snow field. The route wound around Moraine Lake (still frozen and snow-covered) and proceeded over an endle ss flat stretch, where we actually lost elevation over about two miles. We finally arrived at the foot of the mountain, and began the snow slog. The weather was beautiful, but we had fumbled around finding the trail so long that the sun had already risen by the time we reached timberline, which was disappointing. The snow had dissipated a lot since last month, and the previously covered mountain, now was considerably bare. The trail was still snow-covered up until around 7,000 feet, and the snow was getting soft. We reached the end of the snow field and decided to hit the cinder-coated ridge for the remainder of the climb. The trail up this mountain is awful. It is poorly marked, poorly maintained, and is long, ugly and generally unpleasant. I would never make a summertime attempt on this mountain. There are fantastic views to be had many places throughout the area, and with much better trails. At around 8,800 feet, we reached the crater, where we found the lake intact. There were several large, open crevasses on the Lewis Glacier to the right as we continued on. The weather was starting to move in, as Mt. 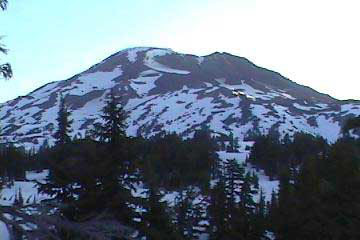 Bachelor and Broken Top, once clear and towering over the trail, were now becoming lost in dark, black, Nimbus clouds. 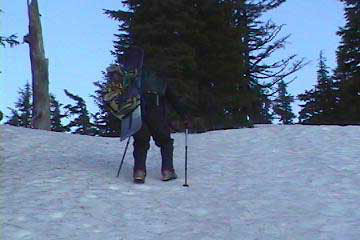 The summit of South Sister was still clear, however, so we pressed on. The snow was now almost nonexistent, and we dropped our snowboards and continued to the top.  Within about 200 feet of the top, clouds began to engulf the summit. We hear thunder claps in the distance as the storm began to roll in. Another climber passed by and said that he couldn't see anything from the top, and we decided that no view wasn't worth the risk of that storm hitting us on top of the mountain. As lightning strikes became visible past Mt. Bachelor, we hurried down the mountain. 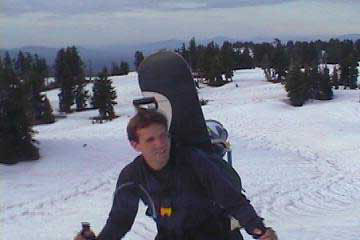 We strapped on our snowboards at the top of the snowfield, and headed down. Sandra had a little difficulty getting star ted with the weight on her back, and ran over a rock, bruising her backside. We ran out the slope, which ended far too quickly, and packed up the boards and put on rain gear just as the hailstorm reached us. Lightning flashed nearby, and hail thundered down as we fought our snowboards, which no longer wanted to be strapped to our packs. Finally, we were on the move again, disappointed in the near summit. We trudged over the flat snowfield, and looked over our shoulder. The summit was now crystal clear with no clouds, and the hailstorm moved on. It figured... We again lost the trail, and followed the GPS back to the car. Once in the woods, the trail became easy to see now, as many people had come and gone since we arrived that morning. We later lost the trail again, but just headed south until we hit the road. The trail was not technical at all, except for one section where we had to traverse across an exposed slope, just a long trudge through soft snow and scree. The route was poor for snowboarding, as it had many ups and downs, and long flat stretches in between downhill runs. We were very disappointed in the quality and visibility of the trail, and the mountain after the snow melts, is quite ugly. The views from the south side were nice, with Broken Top and Mt. Bachelor right there, Mt. McLoughlin, Mt. Thielsen, and even the top of Mt. Shasta were visible from the trail, and from the top, Mt. Jefferson, Mt. Washington, Three Fingered Jack, Middle Sister, North Sister, Mt. Hood and Mt. Adams are quite visible (we've heard), creating quite a panorama. Perhaps we'll try Middle Sister in winter and see what the view holds, but the trail on South Sister was not enjoyable. To view our photos of our trip, click on the link below. Summit Post - Message Board Tet's Mountain Corner - Three Sisters USFS - Wilderness Info.